Welcome our stainless steel wire rope range into your life and enjoy the benefits offered by this 18×7 configuration option, which include reduced abrasion-related wear and tear as well as WLLs of just over 17 tonnes in the case of this 18mm 18×7 Stainless Steel Wire Rope example. Using this wire rope is not limited to one context or commercial setting. It can be advantageous in plenty of places, from the rigging of a boat to the innards of a sewage treatment system. This is mostly thanks to its corrosion resistance, which is common across most high quality AISI-graded stainless steel. So why should you pick this 18×7 strand configuration over an alternative, like the 1×19 rope we produce? The quick answer is that as long as the 17,008 load capacity of this rope is enough for your needs, it will be the superior choice thanks to its lower likelihood of abrading. Why bother attempting to build a wire rope assembly using this 18mm stainless steel rope yourself when Rope Services Direct can do the honours for you? We will turn the true potential of your design idea into a practical reality using the latest techniques and the highest quality fittings. 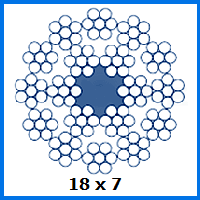 Want more information on 18mm 18×7 Stainless Steel Wire Rope? There are plenty of ways to contact RSD and get your questions answered. You can do so online, or by placing a call to 01384 78004. We have a highly trained, thoroughly experienced team of friendly sales staff at your disposal. 18mm 18x7 Stainless Steel Wire Rope Overall rating: 5 out of 5 based on 6 reviews.